During the 1970s, a series of documents were stolen at the Watergate office complex in Washington, where the headquarters of the National Committee of the Democratic Party of the United States were housed. In January 1972, the Finance Adviser for the President's Reelection Committee (CRP) introduced a campaign intelligence plan to interim Committee Chief Jeb Stuart Magruder, Attorney General John Mitchell, and Adviser to the president, John Dean, involving several and serious illegal activities against the Democratic Party. The activities involved the invasion of the headquarters of the National Democratic Committee, to be able to photograph campaign documents and hide listening devices on telephone lines. Two former CIA officers and a former FBI agent coordinated the strategy to observe, conduct and carry out the intervention at the Watergate complex. Some of the listening devices had to be repaired so the building had to be intervened a second time. This time they were discovered by security and arrested for attempted theft and attempted interception of telephone communications. Those involved in the case were part of the group of Cuban freedom fighters recruited by former CIA agent Howard Hunt. 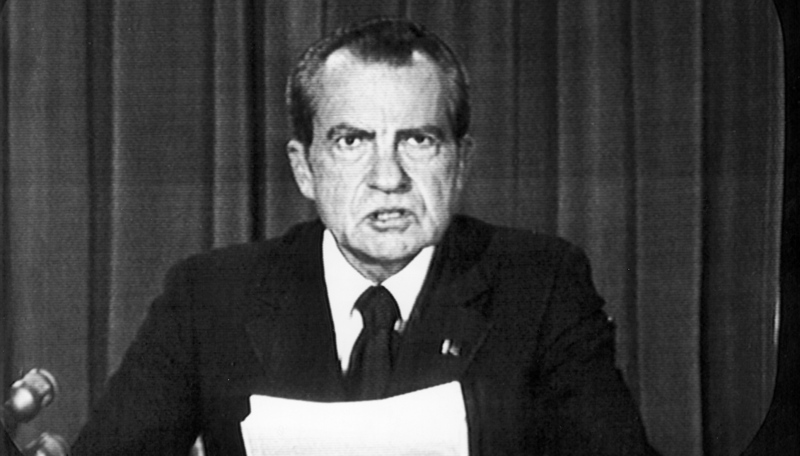 The Nixon Administration immediately initiated the cover-up proceedings to avoid any link between the intervention at Watergate and the presidential candidate seeking re-election. When the name of Hunt came to light, he was immediately associated with the White House procedure called Plumbers of the White House, created to avoid "leaks" of information and security and to maintain a network of espionage within the institution. Both Nixon and his aides tried to get rid of any information that might connect them with the former CIA agent. Under orders from his president, the Chief of Staff, H.R. Haldeman, had to plead before the CIA to block the FBI's investigation into the source of the money that financed the Watergate robbery. A media investigation determined that much of the money donated to the Presidential Re-election Committee ended up in the bank accounts of Watergate thieves. The scandal got to involve figures like the Attorney General, and little by little he was climbing until he reached the very president. A series of recorded conversations showed that Nixon would have had to remove Haldeman and use the gesture to clean up any involvement he might have had in the affair. He also went on to demand the resignation of Ehrlichman, another of his aides, as well as Attorney General Kleindienst and White House lawyer John Dean. 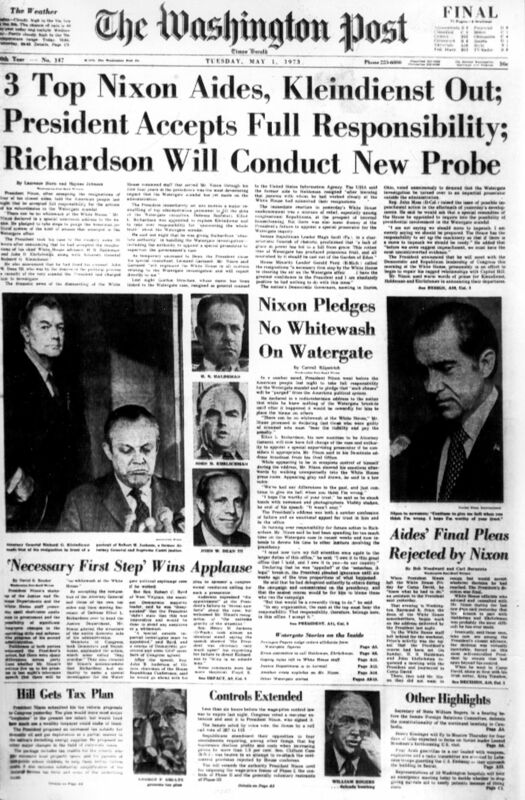 After announcing the resignations of his cabinet, Nixon appointed a new attorney general, Elliot Richardson, who was to appoint a special attorney for Watergate's investigation, independent of the Justice Department. Once the case came to the Supreme Court, the House Judiciary Committee voted 27-11 to charge the president for obstruction of justice, abuse of power and contempt of Congress. Finally, and to avoid being accused, the President resigned his post. Washington, Richard Nixon 8-8-1974.- during the statement made to the nation and the world through television cameras, in which he announces his resignation as President of the United States. EFE / svb. Does the stage seem familiar? As if the accusations and alleged investigations by national intelligence agencies - linking Trump's presidential campaign cabinet with the Russian cyber intervention in the elections - were not enough, yesterday the Democratic Representative of Texas, Al Green, led a press conference to demand the removal of Donald Trump as President of the United States, claiming that the dismissal of FBI Director James Comey represented a "obstruction of justice," according to The Guardian. At the end of the day, the Washington Post reported that Trump had unveiled confidential information to Russian diplomats in the Oval Office last week, and some officials rushed to notify national intelligence agencies. The information detailed sources of data on ISIS plans, jeopardizing espionage strategies and even those involved. The White House's immediate response was skepticism and false reporting, echoing the presidential slogan "Fake News." 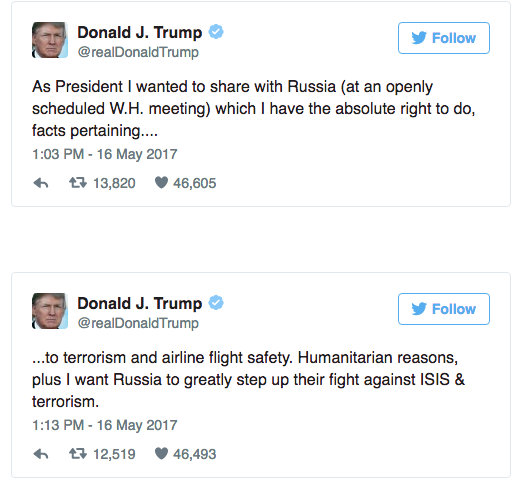 Today, the President turned to Twitter to ensure that he was in his right to share information with Russian diplomats to ensure progress in the fight against ISIS, according to The New York Times. Being absolutely strict with the law, analysts suggest that Trump would be right, but nevertheless, he would have violated his oath as President by offering vital information to a nation that historically has been antagonistic to the United States. While the circumstances of the Watergate scandal and the (now known as) Russiagate are different - as in the case of Nixon Congress was dominated by the Democrats and the Trump case still does not have a special investigator - what counts now is that A & M University professor of history, Luke Nichter, has classified as "political climate": "As in the Watergate, we do not see what is in the next corner, which will be the next headline. There is a sense of acceleration, that the scandal continues to turn”, he told the newspaper El País. Other European analysts support this view. According to the May 11 editorial in Le Monde (France), "the problem, as far as Mr. Trump is concerned, is that he still gives the impression of having something to hide when it comes to his relationships with Russia. No one manages to understand his many declarations of admiration for Vladimir Putin. Inevitably, the circumstances point to possible links between the Russian bank and a president who has been the first to refuse to make public his tax return. A minimum of fiscal transparency on his part could significantly reduce suspicions. " Finally, but being the bottom of the matter, what unveiled the Watergate scandal was a newspaper investigation that prompted a judicial alert, thus assisting a veiled justice by omission. At that time, the Washington Post published in March 1973 the way in which Republicans accused the media of exaggerating the importance of the Watergate affair. According to the media, Ehrlichman (assistant to President Nixon) asserted that the whole matter "operated on two levels: media attention and the interest of the average citizen, which is very low." Likewise, Vice President Spiro Agnew stated in a speech at the University of Virginia in May 1973 that some elements of the press had taken Watergate to a disproportionate extent in”self-complacency" rhetoric. For the Washington Post, 40 years later, the only thing that has changed is the terms used. During his daily press conference, Press Secretary Sean Spicer asked the media last week, "Will you ever accept the idea that there was no coalition?" With this week's events, the answer seems to be a resounding "no".